You know well about my love for Donna Hay’s work: I have some of her cookbooks – cannot live without “Modern Classics 2” – and I’ve been a subscriber to her magazine since September 2006. But for the past year I’ve been having trouble receiving the magazines – last year’s winter issue never arrived and the same happened to this year’s summer issue. I do not know if they’ve changed the shipping method or something, because a friend of mine – who lives here in Brazil, too – has had the same problem. I’d been thinking (with a broken heart) of cancelling my subscription until yesterday, when I saw this on Donna’s website – I purchased the summer issue and now I have it on my computer. I printed one page as a test – wonderful. Since some of you love the magazine I thought you should know about its digital version. Hope you enjoy it! These pavlovas were the dessert of choice for a dinner with friends last week – I made them because I wanted something pretty and fresh. But what really got my attention here was the plums: they were delicious and paired beautifully with a simple cake I’d baked, too. Just perfect. Meringues: preheat oven to 180°C/350°F. Line a large baking sheet with baking paper. Using electric mixer, beat egg whites and salt in large bowl until frothy. Add cream of tartar. Continue to beat until soft peaks form. Gradually add sugar, beating until whites are thick and resemble marshmallow creme, about 5 minutes. Beat in cornstarch, vinegar and vanilla. Drop meringue onto prepared sheet in 6 mounds, spaced 7cm (3in) apart. Using back of spoon, make depression in center of each. Before assembling the pavlovas, beat cream and sugar in medium bowl until medium peaks form. Place meringues on plates. Spoon whipped cream into the center depression. Arrange plum slices on top of the cream and drizzle with the plum juices. When I think of pavlovas, Barefoot Contessa always comes to mind as she makes them often. I love plums, so I must bookmark this for plum season! Oh man...another book I have but haven't tried anything from yet (hangs head in shame). This looks splendid! 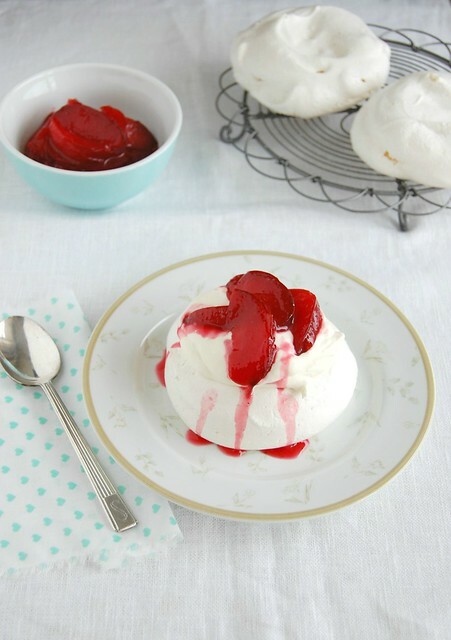 I've never made pavlova, I used to think I wouldn't like it but lately, with all the pavlovas recipes I'm seeing I'm starting to realize I first need to make it and decide if I like it or not!! Hey! The pavlovas look stunning!! I also made pavlova recently, but with creme anglaise instead of whipped cream. Such a perfect, light dessert for spring! Nice one Patricia! I'm a Brazilian living in Australia and very proud of Donna Hay and Other aussies that have succeeded in promoting food culture. Pavlola is one of those trick ones as both Australians and New Zealanders claim for the dish invention. Regardless, your one looks amazing! I'been wanting to buy that book, I'm glad to know I wont be disappointed.